Victoria Beckham did not show off only the latest collections from her line at the New York Fashion Week, but also her collection of brood. 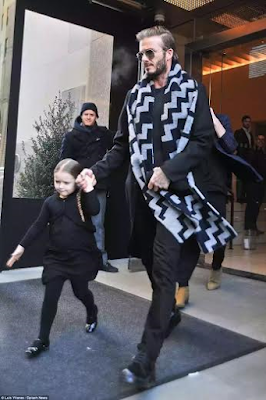 Posh, as she is popularly called in her home country England wowed the timber and caliber in the fashion world with both her cloth lines and her beautiful family of three boys and a girl, plus hubby Beck. 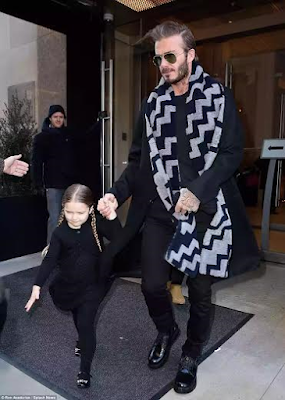 However, the star of the show was 4-year-old Harper who spotted braids, a cute little black dress and a cardigan to match. Victoria's business ventures was reported to have brought in £34 million in the last year, overtaking her husband for the first time ever. The family headed out for lunch after the successful show.